There are so many restaurants in NYC, that even when you find one you love you often end up not getting back there for quite some time. Since I went to Basso 56 over a year ago with the divine Miss Kyle (she of The Obsessed Chef blog fame: http://theobsessedchef.blogspot.com/). The meal we had back then was fantastic from beginning to end. I've always wanted to return and finally did last night. My valentine, Courtney, and I began with a glass of Prosecco Jeio from Veneto, crisp and clean, and it went well with the bruschetta, bowl of olives, and crusty bread that were brought to us as we perused the menu. For apps we got Calamari all Griglia - tender, grilled calamari (about 8 pieces!) with baby arugula over an eggplant puree. The puree didnt have much flavor, but the calamari was perfect and the spicy arugula balanced it out. We also got Carciofi e Parmigiano, a baby artichoke salad with some greens and lemon and truffle oil. Very light and a great starter, topped with punchy parmigiano cheese shavings. I ordered Baccala in Crosta di Patate , a nice-sized piece of fresh cod, baked with a potato crust over some sliced potato on a fennel puree. Accompanying this was a dollop of whipped potato with a few homemade potato chips. The fish was succulent and full of flavor, and I was going to get a Soave Classico but instead opted for a less fruity recommendation by our waiter that was a special, didnt get its name. C got a robust glass of 2008 Poggia d'Elsa, a cabernet/sangiovese blend from Tuscany, mainly a sangiovese with the bite of a cab-sauv behind it. Quite good. Her dish was the ravioli of the day, spinach and ricotta in a light tomato sauce. A good portion, the filling tasted very fresh and the pasta was light. Basso 56 was in the LES on Orchard St before moving uptown. A few steps down into a long and narrow space with the bar upfront. At the other end is an open kitchen. Too often it's a loud, cramped affair in places like this, but Basso 56 gives just a little extra space between tables where you don't feel as if you're dining with those next to you. You'll find the staff here very helpful and professional offering excellent service. The food is fantastic - a solid menu, big Italian wine selection, great specials, and a light touch to the dishes with lots of flavor and fresh ingredients. Sometimes Italian restaurants are coma-inducing heavy cheese and sauce experiences, but not here. Highly recommended! "Private Future" is the current group show at Marc Jancou Contemporary, curated by Michael Cline. A veritable variety show of styles, media and imagery, the show wanders far and wide. "These artists re-present the world as their own and refashion it to their own private means" makes sense with the title, as these works are individual and not of a distinct theme. 16 artists, mostly male - graphite, mixed media, acrylic, photography - abstract, pop, commercial, realistic - all find their place here. 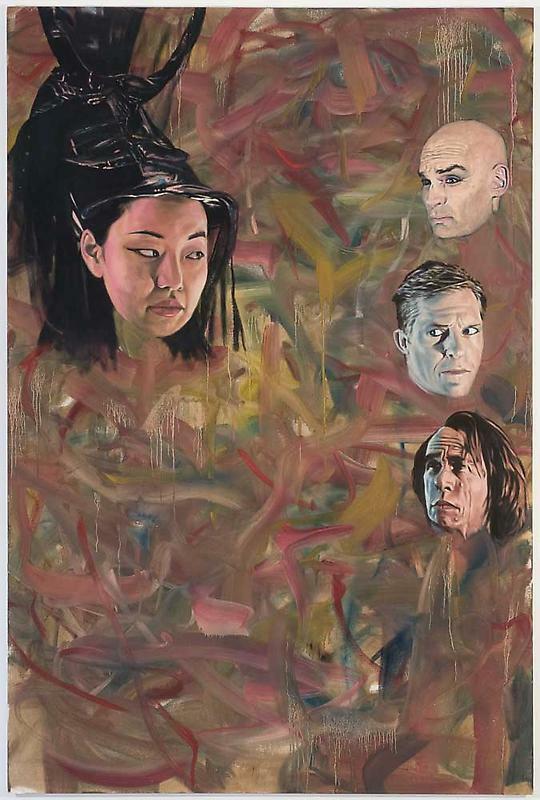 Jim Shaw's "Kill your darlings #3," 48x72" (left) has floating heads glaring at eachother on a swirly ground, an Asian woman on the left and three men on the right. Noir-ish, and this simple composition allows for imaginative narratives to be created by the viewer. On the other hand, Lari Pittman's "Untitled #6," mixed media 88x102", (above on right side of wall) is a collage of recognizable and unrecognizable shapes and images drawing you in but not via a narrative. Then you have Peter Saul's "Squeeze Pimple," acrylic, 59x59" a suited figure with a pimple head which is gross but eye-catchy, a pop image reminiscent of Wacky Packages and Garbage Pail Kids stickers. The ages of the artists in this show is wide-spread as is their geographic locations, again adding to the meandering feel of the show. 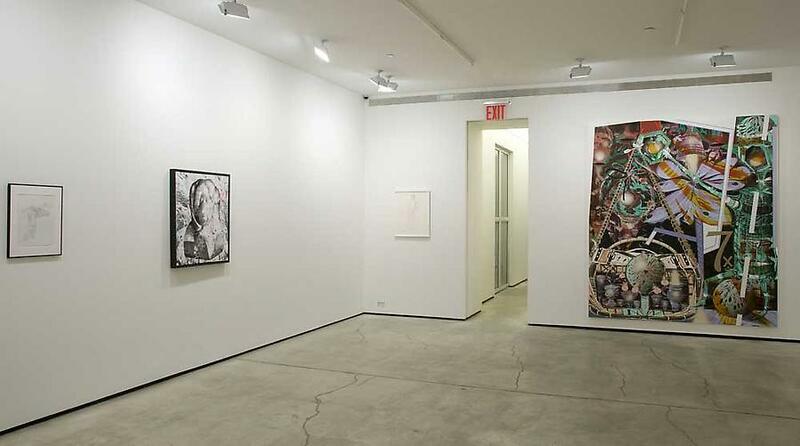 Marc Jancou Contemporary, 524 W 24th St, NYC, show up til Jan 29th. 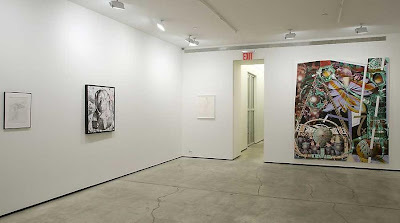 Mike Weiss Gallery (520 W 24th St, NY) has a second solo show by Christian Vincent titled "Tunnel Vision." Many of these large scale pieces feature rows of young boys in perspective, a reference to the title. He also seems to be commenting on conforming to group mentality or instruction - the tempering of the individual, blind obedience, or "the desire for empowerment through belonging?" Are they in a phys-ed class? at a cult or religious camp? is the boy pointing to a "messianic figure" as the statement suggests? These eight large-scale oil paintings have a retro feel in one way, while also imbued with a sense of futuristic foreboding, sort of like the feeling one gets when watching Fritz Lang's "Metropolis." The images remind me of an old stereotypical British boarding school, where conformity and following rules is paramount and individuality is squashed with harsh discipline. Vincent is a resident of LA now, but I'm curious about his past. Paintings that bring other images to mind and make the viewer curious about not only the imagery but the artist must be considered successful. Through February 12th.